We would like to bring the membership up to date on the Zero Based Review process affecting the Outside Maintenance area. On June 20, 2016 City Council voted to accept Administration’s response to the Consultant’s recommendations which included not to contract out the Service Lanes and to continue finding the lowest cost alternative for the Outside Maintenance area. As well, an amendment was put forward at Council for all the stakeholders to meet and see if we could find the savings that the Consultant thought they would achieve by contracting out the Outside Maintenance area. We would like to thank all of our members that took the time to show up in Council Chambers on June 20, 2016. After the June 20, 2016 Council meeting, Doug Morgan met with most of the staff in that area to let them know the results. Since that time, ATU Local 583 prepared some documentation for our members to track how much work they are currently doing in support of the private contractors, who are not living up to their expectations. That is, having our members do the work the contractors should have! ATU Local 583 held a morning and evening Special Called meeting on July 26 where we were able to gather some information from the members that were in attendance to find a solution to increase productivity and find savings. Since this meeting was held, a request was made starting at the City Manager’s office and finally responded to by Doug Morgan for a copy of the unredacted report. Local 583 was denied a copy of this report due to sensitivities around some commercial information in the report. We were looking for this report to see what the consultant was basing the savings of $2.7 million on. Doug Morgan sent an email to this office telling us the savings were based on wages, benefits and productivity. Currently, Local 583 is gathering information, i.e. organizational chart, and then we will proceed to have a meeting in house with our International Vice President Bob Hykaway. After our meeting in house we will start to set up meetings with Management and take our ideas forward and start the discussion. We will endeavor to keep you updated on the process as it happens. Local 583 will also be running an Anti-Contracting Out campaign. This is in the development stages right now. The membership will be informed upon its release. Driver’s license renewal suspensions continue to plague our members. Local 583 is probably averaging one suspension every ten days. An arbitration hearing in 2003 laid the groundwork for Calgary Transit employees to incur a maximum two week suspension for forgetting to renew their driver’s license. For forgetting! A human error. Something we all do. It is termed “driving with an expired license”, not suspended or revoked, just EXPIRED. This is not a criminal act! The importance of this violation in our mind is reflected by the Government’s meager classification as a Traffic Safety Act violation carrying a standard provincial fine of $310.00 and NO demerits. Not to revisit this lost ruling but to show the true impact of the workplace discipline as a comparator, it is a $1,795.00 fine for a full time Community Shuttle Operator and a $3,693.00 fine for a Journeyman Electro-Mechanic in lost wages. This is two weeks at your rate of pay, which is levied every time a Calgary Transit employee’s license has expired. This licensing issue has found its way into the other Local City Unions. This was for the most part, something rare and new to these members. Well, on April 1st the hammer dropped. A CUPE 37 member was fired and another, and another… five in total for “driving with an expired license”. Local 583 informed CUPE 37 about our arbitration history on the issue. Two months later, CUPE 37 had won their grievances, the five current non-renewals ended up as four letters of warning and one two day suspension. The City then informed all the Civic Unions that the penalty for “driving with an expired license” would be a long suspension. Four or five days depending on the Union Collective Bargaining Agreement, until October 1st, so the employees could have time to adjust to the new renewal process which doesn’t include a reminder from the registrar. All the Civic Locals except ATU Local 583 were to be included! There was a concern that it might be confusing to our members. Unjust we say, we are being discriminated against at the very least so we started filing grievances on all “driving with an expired license” suspensions that fell within the timelines of the City’s new position. Local 583 would have thought all City union members would be treated as fairly and equally during the grace period, but apparently not. We may not know until another Arbitrator rules. Local 583 would like to congratulate all Access Calgary Operators on their 1 year anniversary at Calgary Transit, good for them for contributing to the success of Accessible Operations and working with their new employer! There have only been a few challenges along the way with two key ones leading to grievances yet to be resolved. With the refurbishment underway at the Calgary Transit Access Garage it appears the future is good for Accessible Operations. Keep in mind there are many opportunities available to these work area members effective August 24th. This is due to the staff’s commitment to maintaining their Accessible Operations positions until August 25th when they can start looking for other jobs the City may have up for bidding. One of this work area’s new problems is the new method of calculating On Time Performance. It appears the clock, the data terminals, and numbers used can be skewed to make the OTP of the very best employee look dismal. This is disheartening because the former process had the majority of employees buying in to a system that recognized real time and stats which lead to accurate results the employees respected. 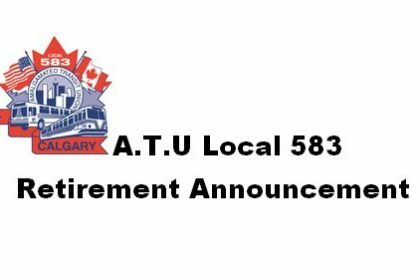 Local 583 has been in conversation with Simon Tusek – Coordinator of Accessible Service who is reviewing the situation at this time of printing and offered to work with Local 583 to resolve it. We have received calls in the office from Operators injured while at work and having emergency medical personnel attend the scene to assist. This should happen as part of the response. The investigating supervisor then gets the employee to complete WCB paperwork to cover any possible lost time and treatments and then the assumption is that everything is covered. If the employee is off for more than 5 days then an Attending Physician’s Statement needs to be completed to ensure your paycheque continues uninterrupted and because WCB and S&A/LTD run concurrently. Just to reiterate, no medical documents are required for an illness of 5 days or less unless deemed suspicious or as a condition of the ASP. However, many complaints coming into our office are that shortly after the injury the employee would receive a bill in the mail for EMS response. Don’t be alarmed when this happens. Even though we have coverage through our benefits to cover an ambulance bill for non-workplace needs, the City will cover the expense under the WCB obligations for on the job injuries. The employee just needs to submit the bill in an internal mail envelope addressed to Corporate WCB #8020 with their names on the outside with the appropriate garage and code #166 with their respective time keeper. Keep in mind this only applies when you are injured on the job. Don’t pay the bill out of your pocket when you don’t have to. On June 26th the Officers had the pleasure of attending Surinder Grewal’s last day of work before retirement. Then two weeks later we were honored to accept an invitation to his retirement lunch. When he greeted us at the door the change in his appearance was striking. He looked ten years younger and said he had lost 15 lbs since his last day and his blood pressure had dropped to normal. It makes you wonder how much of an influence the pressure of our jobs affects our health. We have a tendency to take it for granted that we will someday work that last shift and get to move on to the next great adventure. Please take the time to unwind and reconnect with the things that matter to you. The Canadian Labour Congress is pleased to announce that affiliates have agreed to this year’s Labour Day theme being, “We Stand for Fairness”. This Summer and Fall, the Fairness Works campaign will showcase exactly that, through contemporary and concrete examples. A new TV ad and an accompanying digital campaign will be launched and run through the summer, showcasing for a better Canada Pension Plan as one example of how these changes benefit all Canadian workers. A website will also be launched. Annually there is Stampede Parking available at the Manchester Center on Spiller Road. It is fully run and organized by the Civic Union Coalition, coordinated by IBEW 254’s Business Agent Karen Stoshnof. Volunteers from the Civic Coalition Membership and the City of Calgary donate their time each year to staff it with all proceeds going to two designated charities. This event is a great example of the City and unions collaborating to achieve fantastic results and the organizers thank everyone who contributes to the success each year. Special thanks from the Coalition and Local 583 for Operators volunteering to take extra training to get the required proficiency for driving for a Community Shuttle bus: Dave Shandley, Harry Lew, Raj Jessel, Hermann Muller, Jasvir Gill, Jaswinder Kular, Arjen Dekuyper, Larry Tweedale, Kanwaldip Dhillon, Tanjot Gill, Balvir Grewal, Sarabjit Saini, Kulvir Kaler, Gurpreet Bajwa, Gary Sage, Karin Gill, Henry Sims, Michaela Hannem and Jag Sandhu. Thanks again for being there and being part of such a great fundraising event. For Your Information: Our annual Retirement Banquet is September 24th, 2016 at the Glenmore Inn. There is currently a waiting-list for members ($40/couple) and non-members ($90/couple) tickets. To have your name added to the waiting-list please call the office at 403-258-1258 Ext 0. Congratulations to Frank and Jean Stone who celebrated their 64th wedding anniversary on June 14th and Ron and Mona Johnson who celebrated their 65th wedding anniversary on June 29th!